The definition of cell death is the irreversible degeneration of cellular functions resulting in the loss of cellular integrity (Galluzzi et al. 2018). Cell death is a crucial step in organism development, tissue homeostasis, and host defense. There are many mechanisms of regulated cell death (RCD), where signal transduction molecules are not only initiated but also involved in the propagation of cell death. Initiation of RCD can result from tissue-turnover, known as programmed cell death (PCD), or disruption of the intercellular or extracellular environment (stress driven RCD). Regulated cell death is involved in immunological processes including elimination of infected cells, removal of effector immune cells, and lymphocyte development. RCD, which can act independently of or as a component of homeostasis, eliminates cells that no longer have a purpose and/or that are potentially dangerous. Here damage-associated molecular patterns (DAMPs) and alarmins are released by damaged cells to signal their potential hazard. Accidental cell death (ACD), the instantaneous form of cell death caused by physical, chemical, or mechanical means, and leading to disassembly of the plasma membrane and cellular senescence, the irreversible loss of proliferative potential associated with specific morphological and biochemical features, are not forms of regulated cell death. The area of RCD continues to develop and advance, with the discovery of new mechanisms. The definitions of the most commonly found are described here. Apoptosis, a programmed cell death mechanism, is essential for removing damaged or old cells and is involved in organism development, tissue homeostasis, and host defense of infected or transformed cells. 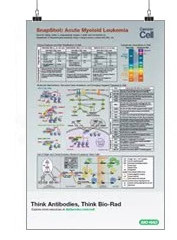 To learn more, read our guide on the stages of apoptosis for both the intrinsic and extrinsic pathways, with advice on how to study these pathways by flow cytometry, western blotting, and imaging, including the antibodies and kits available. Autophagy is a physiological process that (either selectively or non-selectively) maintains homeostasis by protein degradation and turnover of the destroyed cell organelles for new cell formation. However under certain circumstances, autophagy-dependent cell death can occur, and this process mechanistically relies upon the autophagic machinery. Phagophore formation by stress signals. Autophagosome expansion and capture of target molecules for degradation. Autophagosome fuses with lysosome, where proteolytic degradation of autophagosome engulfed molecules takes place. Read our autophagy overview that includes the antibodies and kits available to study this regulated cell death mechanism. Entosis is a process that targets cells to be destroyed following their engulfment by neighboring cells, by actomyosin-dependent cell-in-cell internalization (entosis). Entotic cell death takes place with the engulfment of cells through autophagy protein-dependent lysosomal digestion. Ferroptosis is an iron- and ROS-dependent form of RCD, initiated by oxidative perturbations of the intracellular microenvironment. It is regulated by several molecules (for instance glutathione peroxidase (GPX4), NADPH oxidase (NOX), p53, and nuclear factor E2-related factor 2 (NRF2)) that directly or indirectly target iron metabolism and lipid peroxidation. Immunogenic cell death is the activation of an immune response in immunocompetent hosts to certain stimuli such as viral or cellular antigens. The process involves the release of soluble mediators like DAMPs to the presence of these stimuli. Pattern recognition receptors on the surface of cells of the innate and adaptive immune response recognize the DAMPs and elicit an immune response. Damage of lysosomes by cathepsin activity for example, as a result of bacterial and viral toxins or reactive oxygen species (ROS), often results in lysosomal membrane permeabilization (LMP), with the release of its content including proteolytic enzymes of the cathepsin family into the cytoplasm. This results in the activation of signaling pathways leading to regulated cell death. Triggered by disturbance of the intracellular microenvironment, for example during oxidative stress, MPT-driven necrosis is the loss of impermeability of the inner mitochondrial membrane (IMM), leading to the osmotic breakdown of the mitochondrial membrane and resulting in RCD. Cyclophilin D (CYPD) has been identified as being involved in this process. Cell death is caused by physical and or chemical stresses that result in the induction of mitosis. Mitotic death is also seen at the early stages of necrosis and apoptosis. Also known as mitotic catastrophe, this form of RCD is an oncosuppressive mechanism for the control of mitosis-incompetent cells. Regulated necrosis (necroptosis) is induced by perturbations of extracellular or intracellular homeostasis typically involving mediators such as toll-like receptors, death receptors, and interferon. RIPK3 and its substrate MLKL are the critical defining proteins of the necroptosis pathway. Dysregulation in necroptosis is thought to be associated with cancer, inflammatory, and neurodegenerative diseases. Activated neutrophils are known to release extracellular traps (NETs) that form a web with attached anti-microbial proteins serving to both immobilize and destroy pathogens. The process of NET formation and release (NETosis) results in the regulated cell death of the neutrophil. A regulated cell death pathway that involves ROS signaling messengers. Cell types such as fibroblasts and epithelial cells are thought to be susceptible to ROS accumulated oxeiptosis, whereas lymphocytes appear more resistant. ROS accumulation and mutations in ROS sensors, like KEAP1 that forms a complex with NRF2 and PGAM5, are linked with the progression of disease and cancer. Poly (ADP-ribose) polymerase-1 (PARP-1) activation, when under oxidative stress, leads to regulated cell death by parthanatos. 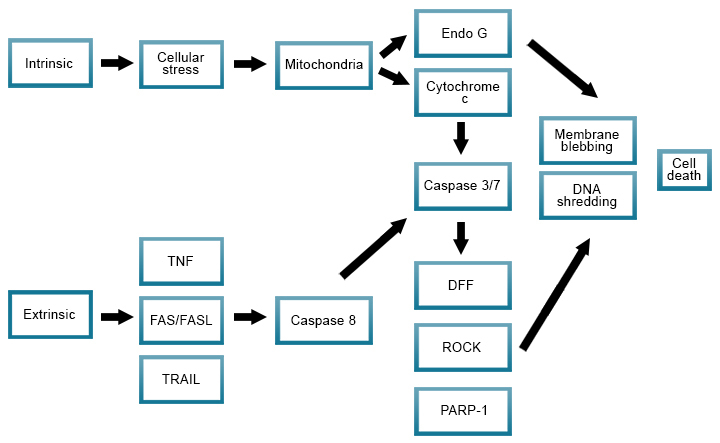 Features of cell death by parthanatos include the upregulation of PARP-1 expression, accumulation of polyADP-ribose polymers, mitochondrial depolarization, and nuclear translocation of apoptosis-inducing factor (AIF). Inflammasome activation of caspases 1 in humans and 11 in the mouse (homologous to caspase 4 and 5 in humans), leads to cleavage of gasdermin D which initiates pyroptosis. The N terminal domain of the cleaved gasdermin D binds to the plasma membrane forming pores permitting the release of IL-1beta and the influx of sodium and water resulting in membrane rupture. Galluzzi L et al. (2018). Molecular mechanisms of cell death: recommendations of the nomenclature committee on cell death 2018. Cell death and differentiation 25, 486-541.